The maximum train speed allowed is 80 kmph. At the highest, we touch 77 kmph from National College to RV Road. Even Majestic to Sampige comes close with a speed of 74/75 kmph.”The slowest speeds are at curves and turns, like near Banshankari where speed can fall to 35 kmph. Bengaluru: June 18 will be a historic milestone for Bengaluru, as citizens will take their first step into the 7-acre wide and 60-foot deep Kempegowda Metro Station. Explaining to the media the salient features and how to navigate at the Kempegowda Metro Interchange, were all the top BMRCL officials. For a new commuter, Asia's biggest metro station could seem a tad confusing. However, there are enough Signage and Direction boards to guide you to the platform and to exit. 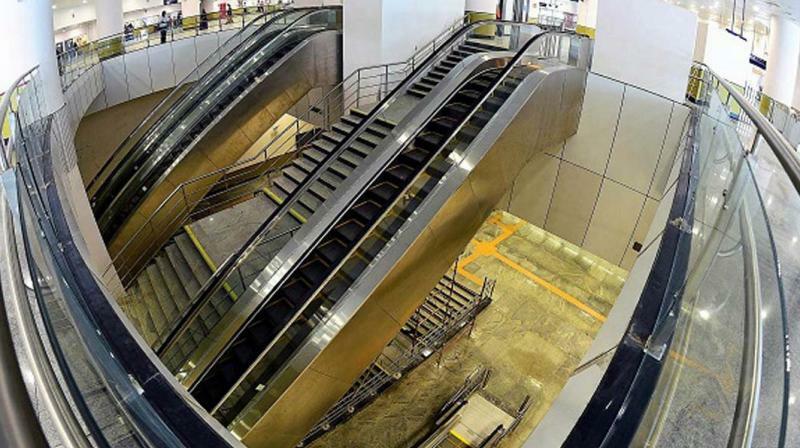 Assuaging fears of confusion, Mr Kharola broke it down, saying, “The third level will have trains taking you from Platform 1 to Baiyappanahalli and from Platform 2 to Nayan danahalli. The fourth level will take you from Platform 3 to Nagasandra and Platform 4 to Yelachanahalli." Mr N.M. Dhoke, Rolling Stock Director, said, “The maximum train speed allowed is 80 kmph. At the highest, we touch 77 kmph from National College to RV Road. Even Majestic to Sampige comes close with a speed of 74/75 kmph.”The slowest speeds are at curves and turns, like near Banshankari where speed can fall to 35 kmph. Mr Dhoke said that service trials are aimed at achieving synchronization. “In our computer controls, data has been fed on train timings and speed. In the service trial, we checked if the train was actually achieving these speeds and time," he said. One of the errors they encountered previously were the announcement not being made in coordination with the train arrival. The four directions in which the Metro traverses had to be synchronised with each other.